What makes a person who they are? What propels and motivates us to do the things we do? More specifically, why do fighters have such a hard time in the twilight of their careers with hanging up their gloves, unable to walk off into the sunset, after such an arduous journey which often times consists of unforgiving years of blood, sweat, and tears? If one was to look up the word fighter in the dictionary the definition is one that any person that ever lived would know does not encapsulate it’s real world meaning. A fighter by any sense of the word is someone who challenges themselves. Who goes beyond their normal limits to achieve success in whatever endeavor they are trying to complete. A fighter may not always seek out but will always stand up to challenges and tribulations put forth or laid out before them. All fighters, especially those in the fight game, need to be able to know that the person staring back at them is the same person they believe themselves to be in their heart of hearts. For those of us that do not know Floyd Mayweather, the man has been a fighter in every sense of the word way before any serious consideration was given to it becoming his profession. Born on February 24th 1977 in Grand Rapids Michigan and then moving at a very early age to the Hiram Square neighborhood of New Brunswick, New Jersey. Mayweather learned about the sometime all too familiar hardships of life at an early age in dealing with poverty and drugs, including a drug addicted mother. Mayweather would later say, “When I was about eight or nine, I lived in New Jersey with my mother and we were seven deep in one bedroom and sometimes we didn’t have electricity. When people see what I have now, they have no idea of where I came from and how I didn’t have anything growing up.” Mayweather’s story however, is one of a more personal nature and perhaps one that would be better told by himself than this author. However, it is important to mention because it bears significance to the “term” fighter. His story could possibly bare some insight into some of his current state of affairs and those future decisions and or plans that may be taking shape or unfolding in his mind’s eye. By most accounts and for all intents and purposes, Floyd Mayweather has achieved everything there is to achieve in boxing. In a career that spanned two decades Mayweather has done what only one other person could, that being Rocky Marciano. 50 times Floyd Mayweather entered the ring and 50 times Floyd Mayweather’s hand was raised in victory. During his career, he has held multiple world titles in five weight classes and the lineal championship in four of those. In 2016, Mayweather was ranked as the best pound for pound fighter in the past 25 years by ESPN. He is one of the most marketable pay per view fighters of all time, as well as, one of the highest paid athletes in the world. So, the real news and noteworthy question of the day is, why after all this is Mayweather talking about the UFC and walking in the octagon? Many people have been asking this particular question. Most people think the idea is outrageous, if not borderline crazy, or an actual joke. A statement muttered in jest. However, I for one do not believe that to be the case. Although not the norm, it is not completely uncommon for fighters to attempt a chance at crossing over from discipline to discipline. 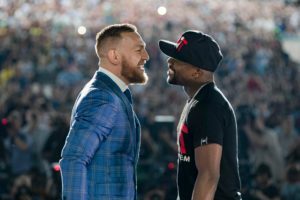 All one would have to do is just look to Floyd’s most recent and last opponent, Conor McGregor, who tried to accomplish this exact same feat. So, once again, why then is Mayweather entertaining this idea? Why after all the victories and all the achievements is it possible that this is in all actuality a real plausible possibility? Simple, because for the fighters we love and adore, those that bleed and train for the fans to see, cheer, and adore the answer is quite simple. All one would have to look at is the meaning of the word fighter.